Milk thistle (Silybum marianum) is a plant native to the Mediterranean region and indigenous to western and central Europe. It’s been used to support health for more than 2,000 years. 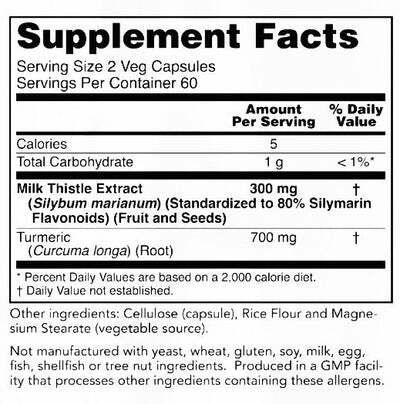 Milk thistle seeds contain an antioxidant flavonoid complex known as silymarin. Turmeric (Curcuma longa) is an ancient spice native to India and Southeast Asia, best known for its distinctive flavor and yellow color, used in curries and some prepared mustards. Curcumin, the active ingredient in turmeric, contains a mixture of powerful phytonutrients known as curcuminoids. How does Milk Thistle Extract support health? Supports the health of the liver even under challenging circumstances.